A requirement for the CMS website was that they did not want it to have the traditional, solemn feel that many funeral director websites have – because of this, Cosmic used light colours with vibrant images to bring the website to life. A rotating header displays images of beautifully crafted coffins for natural burials, alongside flowers and trimmings. 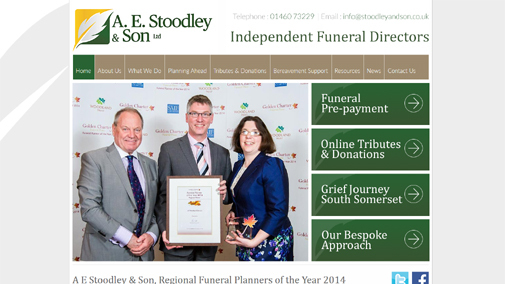 There is also the ability to publish dated news articles such as the company obtaining the title of ‘Regional Funeral Planners of the Year 2014’. The website contains content on the types of services they can offer, as well as options to donate/leave tributes, bereavement support and resources that would be of use. The website makes use of responsive templates, meaning that website visitors will be able to read the website content at optimum viewing on mobile and tablet devices, as well as a fat footer which is great for search engines.